We present a field study on the drought effects on total soil respiration (SRt) and its components, i.e., “autotrophic” (SRa: by roots/mycorrhizosphere) and “heterotrophic” respiration (SRh: by microorganisms and soil fauna in bulk soil), in a mature European beech/Norway spruce forest. SRa and SRh were distinguished underneath groups of beech and spruce trees using the root exclusion method. Seasonal courses of SRa and SRh were studied from 2002 to 2004, with the summer of 2003 being extraordinarily warm and dry in Central Europe. We (1) analyzed the soil temperature (T s) and moisture sensitivity of SRa and SRh underneath both tree species, and (2) examined whether drought caused differential decline of SRa between spruce and beech. Throughout the study period, SRa of beech accounted for 45–55% of SRt, independent of the soil water regime; in contrast, SRa was significantly reduced during drought in spruce, and amounted then to only 25% of SRt. In parallel, fine-root production was decreased during 2003 by a factor of six in spruce (from 750 to 130 mg l−1 a−1), but remained at levels similar to those in 2002 in beech (about 470 mg l−1 a−1). This species-specific root response to drought was related to a stronger decline of SRa in spruce (by about 70%) compared to beech (by about 50%). The sensitivity of SRa and SRh to changing T s and available soil water was stronger in SRa than SRh in spruce, but not so in beech. It is concluded that SRa determines the effect of prolonged drought on the C efflux from soil to a larger extent in spruce than beech, having potential implications for respective forest types. 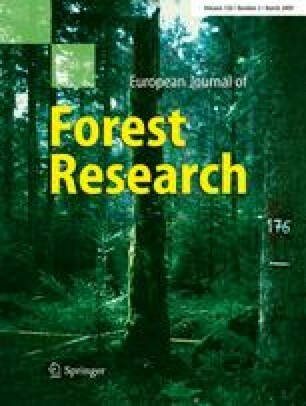 This article belongs to the special issue "Growth and defence of Norway spruce and European beech in pure and mixed stands." The authors gratefully acknowledge funding through SFB 607 “Growth and Parasite Defence – Competition for Resources in Economic Plants from Agronomy and Forestry” provided by the Deutsche Forschungsgemeinschaft (DFG). We also thank Ivan Nikolov for his skilful support of the fine-root analyses and soil respiration measurements, Thomas Feuerbach for his precise technical assistance, Dr. Holger Holland-Moritz (LWF: Bayerische Landesanstalt für Wald und Forstwirtschaft, Freising) for helpful comments on statistical evaluations, Prof. Dr. Anton Hartmann (Helmholtz Center Munich) for hints on literature, and Philip Wipfler (Chair of Forest Yield Science, Technische Universität München) for supplying the stem diameter increment data. We also thank Dr. Carolyn Scagel, USDA-ARS, for helpful suggestions on an earlier version of this manuscript. The information in this document has been subjected to EPA peer and administrative review, and it has been approved for publication as an EPA document. Mention of trade names or commercial products does not constitute endorsement or recommendation for use.